For patients at Saint Luke's Hospice House, four-legged volunteers are providing a unique kind of therapy to bring relief. KANSAS CITY, Mo. 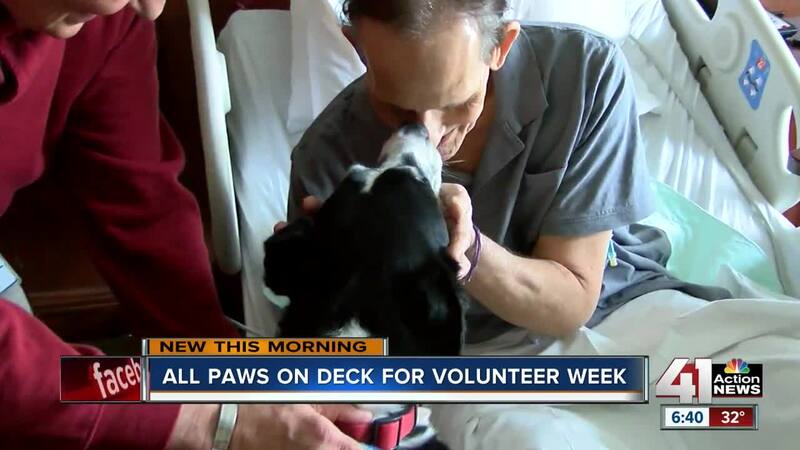 — Four-legged volunteers are giving patients at Saint Luke's Hospice House a special kind of care this National Volunteer Week. Through a program called "Dogs On Call," in operation since 2015, dogs provide a unique kind of therapy. "We have teams of 22 dogs and their owners that come, sometimes expressly, on any given time of the week," Saint Luke's Hospice House Volunteer Coordinator Llinos Leisy said. "Others are available, just to come, even in the middle of the night, if that would be." Eleven-year-old Husker and his owner Tom Klingner have been a part of the program for two years. "He loves people," Klingner said. "For 11 years old, he has a lot of energy." Dogs such as Husker visit patients' rooms and spend time with them and their families. "Somehow, they instinctually know who in that room needs that comfort in that very time," Leisy said. Husker, a certified therapy dog, knows exactly where to go and who to comfort in their time of need. "He will go right into the rooms, go right up to the patients, or the family members and he immediately puts them at ease," Klingner said. It's an ease one patient felt immediately, taking a pause from the day to day, to smile with a new friend. "I see them react to him and whether we're in there 5 minutes or 30 minutes, it's just — you see the relief," Klingner said. "They've had the time to divert their attention to something else other than family member not doing well." Each of the dogs has their own business card, too.